These free bench plans will help you build a bench for any room in your home or outside on your patio or deck. When you're finished you'll have a high-quality bench that cost you way less than the one you would buy at a furniture store. The free bench plans contain everything you need to plan and execute your bench project. Blueprints, step-by-step directions, cut lists, material lists, and diagrams will take you through this beginning woodworking project and you'll have your bench built in an afternoon or two. There's a wide style of bench plans below that include benches with and without backs. They're built in a variety of wood and some are painted while others are stained. With all these options, I'm sure you'll find the perfect bench plan for your home. That's My Letter has built this useful shoe storage bench and is giving away the plan for free. Included are diagrams and step-by-step building instructions so even the most novice of builders can take on this project. 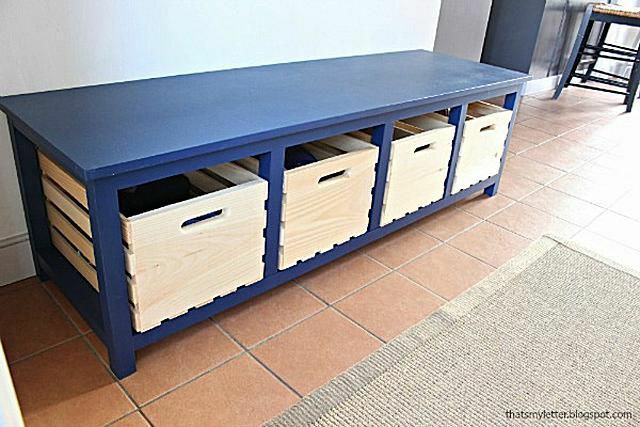 This storage bench was designed so it easily fits four large storage crates. This adds a lot of room to store shoes, hats and gloves, sports equipment, and just about anything else you and your family need quick access to when you're headed out. 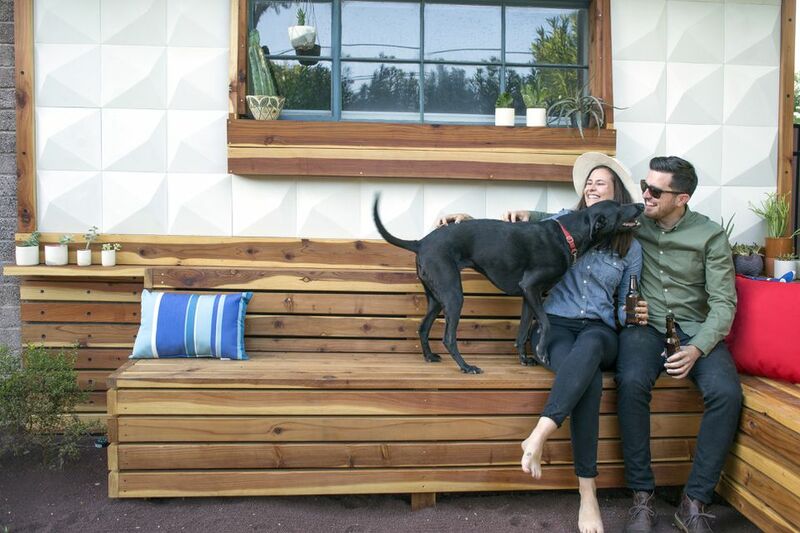 This free plan from Jays Custom Creations explains everything you need to build not only an outdoor bench but also a small side table. The bench requires some 2x4s, screws, and other standard woodworking supplies like glue and a saw. The cutting diagrams and placing illustrations in this plan are color-coded to make it super simple to piece together. Plus, all the measurements are clear and easy to understand. There's also a video that shows how to put the bench together. This is The Design Confidential's free bench plan for building a 38" Chesapeake Banquette (here's the 48" version). The total cost of this project is estimated to be under $25. Everything you need is spelled out for you before the instructions begin, which is great; the tools, lumber, materials, and cut list - everything you need to build the bench. The Design Confidential is one of the best free sources for woodworking plans because the instructions are very thorough and are accompanied with illustrations showing the exact piece of the bench that the particular step is describing. Another free bench plan can be had at DIY Garden Plans. As you can see in the image, this bench isn't made up of anything too complex, so it should be a perfect project for a beginner. The bench is 5' long and stands just over 1.5' off the ground. It requires a single 8' long 2x12, one 8' long 2x4, and three 1/2" deck screws. A PDF is available at the bottom of the DIY Garden Plans page that includes a few short instructions. There aren't many steps to this plan, but that's actually a good sign because it means the bench is pretty simple to put together. All the details and pictures necessary to build this bench are included in the plan. Just gather the few materials at the top of the HandymanWire page to build this bench using the instructions from their free plan. Like the other plans from this list, HandymanWire includes the cutting dimensions so you know exactly what you need to do from the very start. In addition to color-coded illustrations are real-life pictures of the construction process to help guide you through the steps. From Woodworking For Mere Mortals is this free plan for a bench made from 2x4s. Depending entirely on where you get your supplies, this bench could cost as little as $30. At the bottom of the Woodworking For Mere Mortals is a link to plan details, which includes some short instructions, cutting diagram, and illustrations showing how both the top and bottom half of the bench should be constructed. There's also a video showing the whole project being built, plus a SketchUp file on their website so you can manipulate the details of the bench, like its color and size. Also from Woodworking For Mere Mortals is this free bench plan that explains how to build a bench using just five boards. There are printable diagrams for use as cutting guides as well as a video showing how to build the bench. The bench stands 16" from the ground, is 14" deep, and stretches 36" across. HowToSpecialist is another place to get a free bench plan for one of your woodworking projects. Though you can definitely adjust these measurements, the frame of the seating portion of the bench is 60" long and 18" deep, and the backrest is around 23" tall. The steps in this plan are very detailed and come with illustrations and written instructions for precise explanations. Perfect for the inexperienced woodworker is this $20 DIY bench plan from RemoveandReplace. It stands 17" tall, 3' long, and 1' deep. Since there isn't a materials or tools list in this plan, you must read through the steps before you start so you know what you need. The steps in this bench plan are very detailed with images, so it shouldn't be difficult to understand the process. Some of the best DIY projects are ones that copy an item you just don't want to buy yourself, like this $15 imitation of a $700 bench. A materials and tools list are included before the steps, so be sure to review them to make sure you have what you need to get started. As the picture would indicate, there aren't very many steps required to build this bench. Plus, with the images and details provided, it really should be pretty easy for anyone familiar with even the basics of woodworking. Through building the bench and waiting for things to dry, you should expect to have it completed in around 6 hours. Though the overall bench probably isn't too difficult to construct, the sides of this bench from MyOutdoorPlans is a unique shape that may take some work. However, the instructions in this plan are much like the others on this list - very detailed and include every single measurement you need to know. Following illustrations for building the sides of the bench are similar instructions for the seat and backrest. Though there are several more pieces to it, MyOutdoorPlans has another free bench plan that appears to be a bit easier to build than the one from above. The illustrations in these steps are colored and labeled with a letter so you can easily see where every item in the materials list is located on the bench. This bench is 48" long, 34" off the ground, and 18" deep.